The SYM Quadlander600 ATVs feature a streamlined into 4x4 SUV design, and are equipped with a powerful 41.3ps liquid-cooled 4 valve 4-stroke engine. The Quadlander600 ATV combines off-road and on-road features for applications including trailing, cruising and farm work. The SYM ATV features a push button 2WD/4WD transmission, a multifunction digital dash with fuel gauge, clock and speedo for easy monitoring, and a fully independent front and rear suspension with adjustable preload setting. The SYM Quadlander600 ATV, available from SYM Atv Australia , comes with a number plate mount, indicators and mirrors as standard. 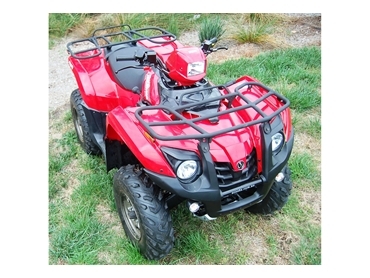 The fully automatic ATV Quads are also available in a two-seater style, which is called the Quadlander600LE.